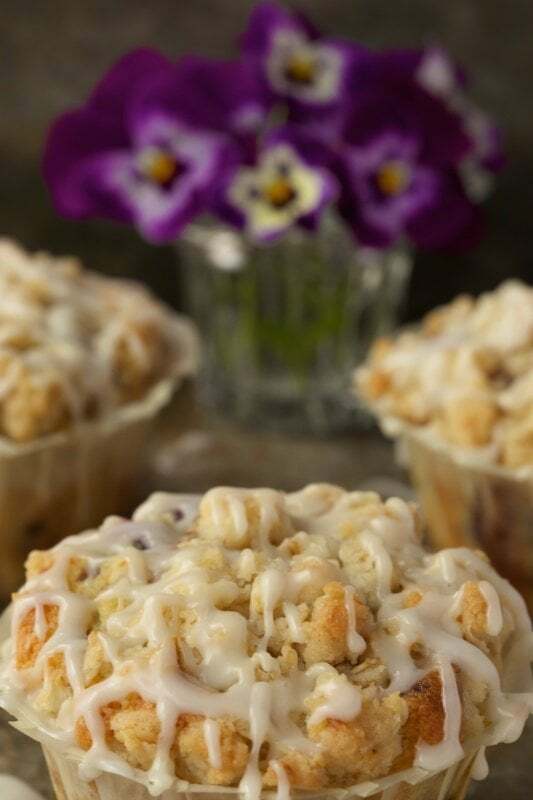 These Bakery Style Lemon Blueberry Muffins are tender and moist with a buttery streusel topping and a drizzle of sweet lemon glaze. Irresistible! You may have noticed that I’ve been in a crummy mood lately? Oops, that was a spelling error. I meant to say a crumb-y mood. As in, these kind of crumbs. And now I’ve made Bakery Style Lemon Blueberry Muffins with another wonderful crumb topping – see what I mean? Yes, we’re definitely quite partial to all things crumb-y. Well not all things. Not like crumbs on the floor and definitely not like crumbs in the bed. Oh no. But when it comes to baked goods with a lovely layer of buttery sweet crumbs, that’s when we’re hopelessly enticed. And these Bakery Style Lemon Blueberry Muffins perfectly fit the bill! So when I had the opportunity to spend some time with three of my favorite little girls, I decided something crumb-y and yummy like these Bakery Style Lemon Blueberry Muffins were in order. We had a lot of fun cooking together and the resident photographer/grandpa caught the young chefs in action. 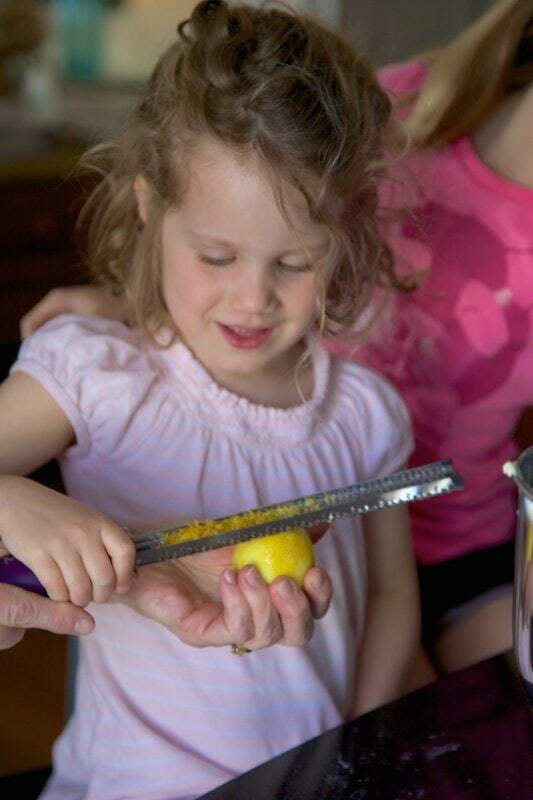 Cooking with children can be one of two things: either a complete disaster (and the biggest mess your kitchen’s ever seen) or a wonderful time of bonding, fun, and equipping a younger generation with essential life skills. 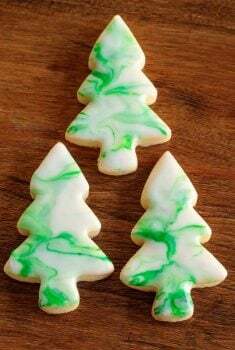 Kids love to help in the kitchen and, believe it or not, opportunities for “teachable moments” abound in the midst of measuring flour and creaming butter and sugar. I spent many hours cooking with my own kids as they were growing up, and now that they’re grown and have children of their own, I’m having fun passing on a bit of culinary proficiency to our next generation. With five of them, seven and under, I always have willing participants when I ask, “Who wants to cook with Grammy?” Over the years, I’ve learned a few tips and tricks to make the experience more enjoyable, not only for them, but for myself as well. Here’s my list. Pick a simple project they can feel successful at. 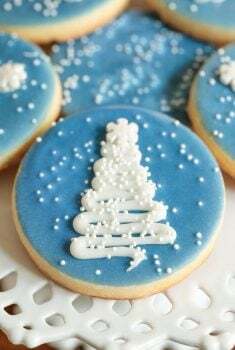 Cookies, muffins, cupcakes are all great projects kids will enjoy. 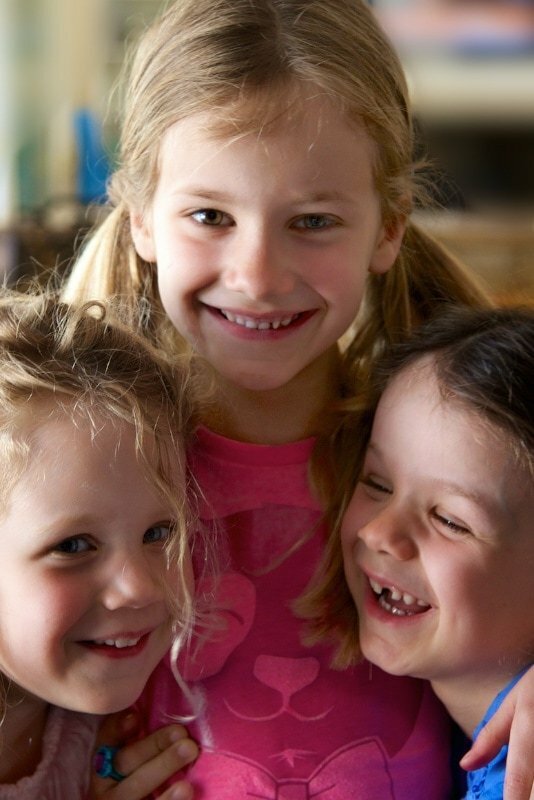 Give them a few choices of age-appropriate projects and let them help in the decision-making process. Get prepared before the kids even enter the kitchen: lay out supplies, equipment, measuring cups, spoons, scale, etc. Do any necessary (or dangerous) prep to make things run smoothly and safely. The kids don’t have to do the entire project, but make them feel like they’ve been responsible for the whole project. Expect that the recipe will take longer and make more of a mess than if you do it yourself. Start with teaching them good kitchen hygiene; the importance of hand-washing and keeping surfaces and equipment clean. 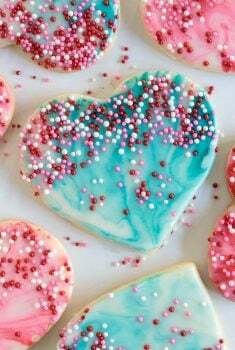 Talk about the recipe and encourage lots of participation. Let the older kids read the recipe or read it out loud to the younger ones. Set the ground rules in advance: cooperation, respecting each other, taking turns, etc. Make them think and solve problems appropriate to their age. Ask the kids questions as you proceed. “What would happen if we added too much flour?” “Why do we need to add baking powder, or, what would happen if we skipped the baking powder?” “What is vanilla used for?” There are also math problems that can be solved in the kitchen as well as history (when and how recipes have come into being) and geography (where a particular recipe originates from). Most importantly have fun! You’re creating memories both you and the children will carry with them for many years to come.If you’re looking for a great way to start cooking with your children, grandchildren, nieces, nephews, etc., this blueberry muffin recipe is perfect. It comes together quite easily with simple steps that offer lots of opportunities for participation. The results are fantastic bakery-style blueberry-lemon muffins filled with juicy berries and topped with a mound of buttery crumbs. 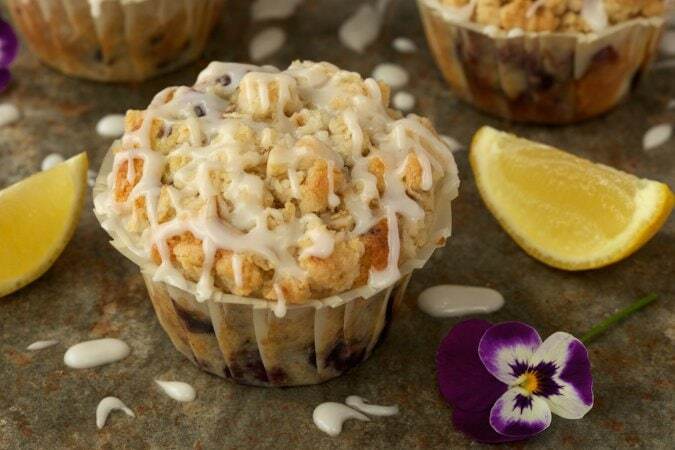 You can even include a foreign language lesson, teaching the kids to say, “Bon Appetit!” as they offer their delicious Bakery Style Lemon Blueberry Muffins to family, friends, and guests, who will be sure to offer rave reviews. 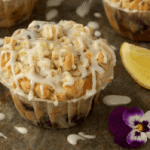 Love these Bakery Style Lemon Blueberry Muffins? These Morning Glory Muffins are healthy and crazy delicious, and also a wonderful way to start the day! 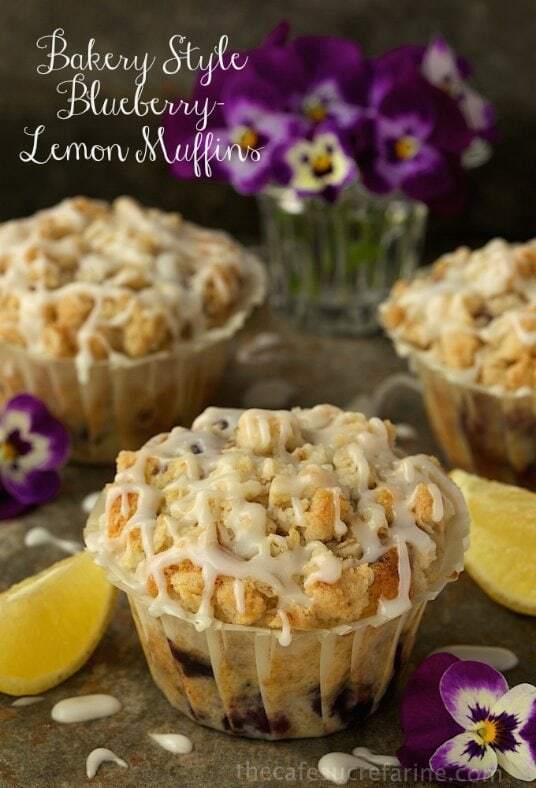 These Bakery Style Blueberry-Lmon Muffins are tender and moist with a buttery streusel topping and a drizzle of sweet lemon glaze. Irresistible! 2 cups fresh or frozen blueberries My favorites are the tiny wild blueberries available at most larger grocery stores. 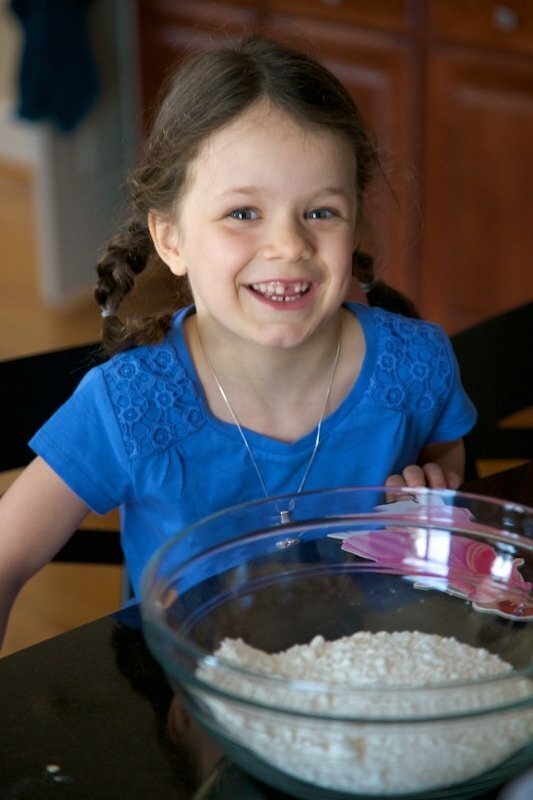 Make the crumb topping by combining the melted butter, sugar, flour, oatmeal and salt. Stir with a fork until crumbs form. Set aside. Combine flour, baking powder and salt in a medium size bowl. Set aside. If using frozen blueberries, place them in a small bowl and return to freezer until ready to use. If using fresh berries, place in a small bowl and set aside. In the bowl of an electric mixer, beat butter for 1 minute until soft and fluffy. Add sugar and continue to beat for 3 minutes. Add eggs, one at a time and beat just until incorporated. Add buttermilk, vanilla and lemon zest and mix on low until combined. Remove bowl from mixer. Add flour mixture and stir, by hand, until flour disappears. Do not over mix or muffins will be tough. Gently stir in blueberries. Divide mixture evenly in the prepared muffin pan. Sprinkle with the crumb topping. Bake at 350˚F for 22 to 25 minutes or until light golden and a toothpick inserted into the center comes out clean. Allow muffins to cool for 5 minutes in the pan before removing to a wire rack. Drizzle lightly with the lemon glaze. For lemon glaze, combine powdered sugar and lemon juice in a medium size bowl. Stir with a fork or whisk until smooth. I love this recipe. The muffins are always tender and delicious. I recommend your recipe to my friends especially when we go blueberry picking. Always a tasty treat! Are the ones pictured jumbo size or are those standard? Would I have to triple the recipe to make 18 jumbo? They are standard size. I think doubling the recipe should give you plenty to make at least 18. Can I use cranberries instead of blueberries? Hi Tina, you could but cranberries are much more tart than blueberries so you would need to adjust for that. 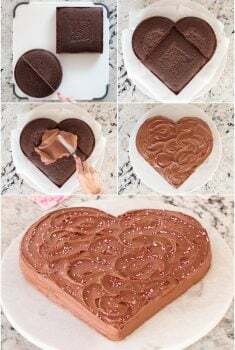 Hmmm, I haven’t tried this recipe as a cake so I can’t say for sure.